Chevrolet Introduces The 2017 Camaro ZL1! What does Chevrolet have to say about the all-new 2017 Camaro ZL1? The iconic ZL1 has been reinvented for the sixth-generation Camaro and is purpose-built to challenge the most advanced sports coupes in the world. A refined, driver-focused cockpit helps you get every last bit of performance from the supercharged 6.2L LT4 engine and available 10-speed automatic transmission. Simply put, ZL1 is a sports car designed to dominate wherever you drive it. Take hold of the flat-bottom, suede-wrapped steering wheel as the roar of the dual-mode exhaust rings through the tech-appointed and comfortable cabin. Standard RECARO® performance seats with suede inserts plant you into the perfect position. You put your hand on the suede shifter, press your foot down on the accelerator and you’re gone, ready to take on the track or a cross-country jog. 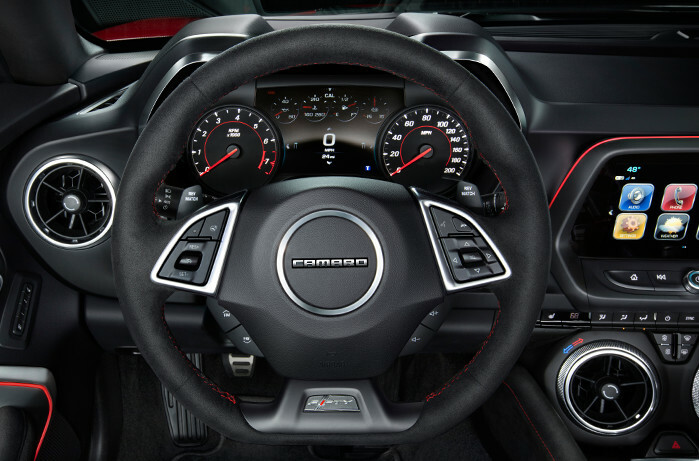 That’s the refined, performance-minded interior of ZL1. The fully automatic convertible soft top can be lowered by the press of a button or remotely using the key fob — even while driving up to 30 mph — and hides beneath a hard, body-colored tonneau cover to help maintain the high performance envelope of ZL1. 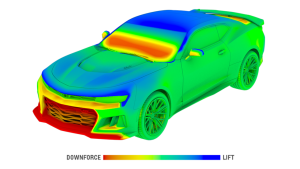 Virtually every design decision was made with performance and aerodynamics in mind. A functional carbon-fiber composite hood air extractor pulls heat from the engine compartment and helps reduce lift. The front fascia provides even more airflow and features large outboard cooling ducts to push air to the brakes. Even the front Chevrolet bowtie badge has been hollowed out for maximum airflow. From the massive front grille openings to wider front fenders that accommodate the wider wheels and tires, ZL1 is designed to maintain a high level of performance from the first lap to the last. Built on a lighter and stiffer platform than previous generations and equipped with a suite of performance technologies that includes Magnetic Ride Suspension, Performance Traction Management and electronic Limited Slip Differential, ZL1 gives you a one-of-a-kind driving experience. The standard 20″ forged aluminum wheels are wrapped in 285/30ZR20 front and 305/30ZR20 rear Goodyear Eagle® F1 Supercar summer-only tires† that are designed to grip the track. Large Brembo® 6-piston front and 4-piston rear brakes give ZL1 precise braking while resisting fade. ZL1 features a performance-tuned suspension system that includes Magnetic Ride technology that adapts 1,000 times per second, adjusting the suspension for performance driving. Standard electronic Limited-Slip Differential is designed to improve stability and responsiveness for better handling and balance. Under the hood, you’ll find a supercharged LT4 6.2L V8 engine with intake and exhaust features that are tailored specifically for Camaro. With an estimated 640 horsepower and 640 lb.-ft. of torque, ZL1 is the most powerful Camaro ever produced. The available exclusive Chevrolet Performance Data Recorder logs video of your driving sessions, along with real-time performance data, onto an SD memory card so you can analyze your technique and improve your driving abilities. And when someone else is driving the car, Valet Mode can capture video and data for additional peace of mind. Apple CarPlay™ and Android Auto capability† take the features that are useful while driving and puts them on the vehicle’s display in a clean, simple way. This allows you to make calls, send and receive messages and listen to music right from your touch-screen or by voice, all in an interface you’re already used to. And with an available 4G LTE Wi-Fi® connection† through OnStar®, you’ve got the freedom to roam while connected. 0 comment(s) so far on Chevrolet Introduces The 2017 Camaro ZL1!